On Thursday 13 September, the Orange Prize short-listed author Attica Locke will return to Stratford for another conversation with my old friend and Newham Monitoring Project comrade Cilius Victor, at the official UK launch of her new novel "The Cutting Season". The event is organised by Newham Bookshop, who were one of the first to recognise and promote Attica's brilliant first novel "Black Water Rising" back in 2009. The last encounter between her and Cilius was hugely enjoyable, as was her book - a crime thriller set in 1980s Houston in Texas that centres on the discovery of a body by a struggling African-American lawyer. 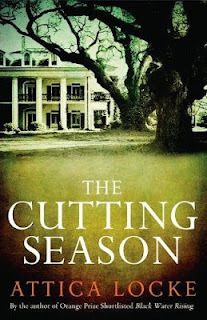 The new novel also starts with a dead body, this time found in the grounds of Belle Vie, a historic plantation house in Louisiana's Sugar Cane county that is managed by the book's central character, Caren Gray. The murder of a migrant worker unravels dark secrets about the plantation’s past and the history of slavery in the American South.